When I went down to Marcellino’s last Friday night to pick up our pizza and wings the order wasn’t yet ready so I had a chance to read over some of the mixed martial arts fight posters hanging on the wall of of the very popular West Main Street pizzeria. Amsterdam’s Tommy Marcellino, the younger brother of Tony who runs the place happens to be a very skilled professional MMA fighter, who’s appeared in nationally televised bouts in the past and is scheduled to do so again in the very near future. Those posters brought back plenty of memories. Back in the 1970s, another Amsterdam native, Bobby Stewart was making quite a name for himself as a fighter. Unlike Marcellino, Bobby’s sport was boxing and he had won a National Golden Gloves championship in his weight class in 1974. He then went on to win 13 of 16 professional fights before retiring from the ring and becoming a counselor at Tryon School for Boys, where he discovered future heavyweight champion of the World, Iron Mike Tyson. As good as Marcellino is and Stewart was, the greatest professional fighter in the history of Amsterdam New York was Buddy Benoit. His real name was Delor Benoit Jr. He was born in the Rug City on this date in 1920. His Dad had moved here from Canada and worked in this town’s carpet mills. The Benoit’s lived on Fairview Place. Back in the 1930s, Amsterdam’s summer parks and playground program included boxing. That’s why so many young boys living in this city back then got involved in the pugilistic art. Benny was one of them. He used to spend his summers hanging around Brookside Park where he put on boxing gloves for the very first time in 1936 and defeated Tony Squillace in his first ever fight. He went on to become the 118 pound City Champion that year. 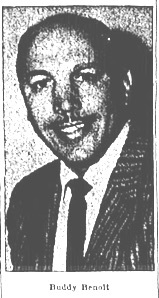 Benoit’s uncle, Harry O’Dell recognized his nephew had potential and took him to meet JoJo Zeno, who at the time was considered the dean of this area’s boxing trainers. Zeno took Benoit under his wing and for the next four years the youngster was very active and very successful on both the area and regional AAU boxing circuit. He was winning just about every local AAU Tournament he entered and in 1940, he almost won the National Middleweight title, losing a decision to future hall of famer, Joey Maxim in Boston. You can read the rest of my story about this Amsterdam-born pugilist in my new book “A Year’s Worth of Amsterdam Birthdays.” To order your copy, click here. Hello! I came across this while looking for something else…very nice birthday wish, thank you. I’m Bari Lynn (Benoit) Rudmann, Delor Benoit’s (Buddy O’Dell) daughter. It’s nice that people in Amsterdam still remember the people who grew up there. My Dad talked fondly of his time in Amsterdam all of his life. Unfortunately he is no longer with us. He passed away just after his 94th birthday. His body was still healthy! But Alzheimer’s Disease claimed him. We miss him.